Orion had radiographs last week the x-ray shows that the area of consolidation is shrinking and air is returning to those healing sections of the lung. Our Kemp's ridley called Bubba recently underwent a procedure in the Aquarium Medical Center (AMC). After this turtles last set of radiographs we noticed an increase opacity in the right lung compared to the left. The animal was then scheduled for a bronchoscopy. 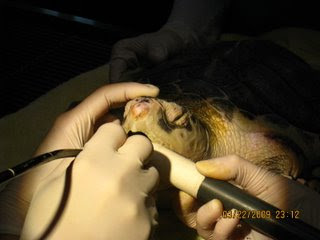 Because we were going to be sticking an endoscope down the animals trachea to reach the lung the turtle was sedated. Whenever we sedate any of our animals we have a data recorder to make sure the animal's breathing (RR) and heart rate (HR) stay within normal limits. We then have to prop the mouth open and insert the endoscope to reach the area of lung that we will be sampling. Once the endoscope is placed through the glottis it is then guided to the location of the lung where we will be trying to obtain samples. This is done by watching the monitor the endoscope is attached to. Once there we are able to take different samples and send off to the lab. We are still waiting for results. Again this procedure was done in the AMC and guests that day were able to watch the whole process. On November 20, 2008, Goose stranded in Eastham and came to the Aquarium for treatment. Goose, named for a gooseneck barnacle on his carapace, is a green sea turtle. When he first arrived he was not breathing on his own and had to be placed on a ventilator. He was also given emergency drugs to stimulate his heart and breathing. 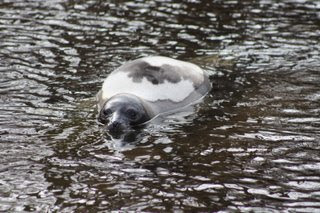 After about two hours, Goose became alert and was swimming in a kiddie pool for short periods by the end of the day! As posted on February 11, Goose spent some time being cared for at the University of New England Marine Animal Rehabilitation Center and returned to the Aquarium when our Sea Turtle Recovery Room opened. [The space that housed the Sea Turtle Recovery Room is now The Trust Family Foundation Shark and Ray Touch Tank. Rescued sea turtles are now cared for at the new, much larger Animal Care Clinic in Quincy.] He is now off medications and doing very well. He is currently on a diet because he eats everything in sight, except his vegetables of course. We offer him romaine lettuce because green sea turtles eat plant material in the wild, but so far he prefers fish. 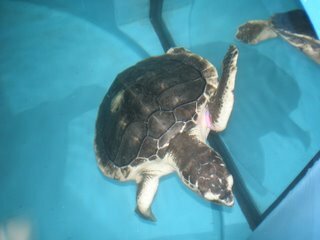 There is a great view of him in our Sea Turtle Recovery Room so stop by and visit! We photographed these two little wonders sitting outside the Sea Turtle Rehabilitation Clinic. 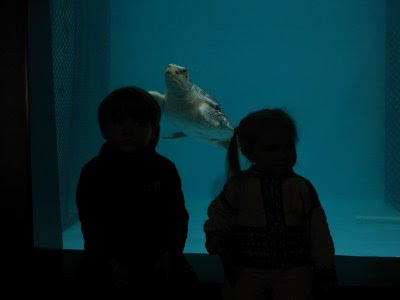 [The space that housed the Sea Turtle Recovery Room is now The Trust Family Foundation Shark and Ray Touch Tank. 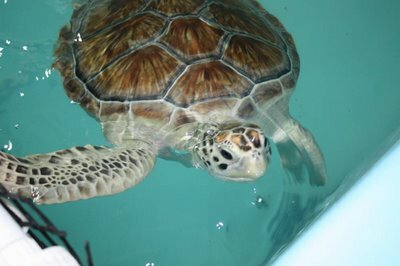 Rescued sea turtles are now cared for at the new, much larger Animal Care Clinic in Quincy.] They appeared amazed and peaceful while watching the sea turtles swimming around. In particular, their curiosity and awe while watching Route swim around his tank reminded me of why I became a sea turtle biologist in the first place. Here is some footage of the Orion's procedure that Dr. Innis reported on earlier. Orion is our Kemp's ridley turtle that is still recovering from pneumonia. The footage shows Dr. Innis drilling into the carapace of the sea turtle so that we can acquire a biopsy from the lung. Orion was first put under anesthesia, then had a small hole (5 mm diameter) drilled through the shell. Next you will also see the lung biopsy being taken through the endoscope. Okay, you caught us. BUT ... while the turtles continue to recover I thought I'd use this blog to share some of the work our Rescue Rehab team does outside the aquarium. Just yesterday the team spent the afternoon responding to an adult harp seal that traveled a little far up a tidal river in Saugus! I wouldn't say it was stuck, but it was in shallow water and it would have had a long trip back to the ocean. So, the team decided to relocate the animal to a beach in Nahant. The decision to relocate was also for the safety of the public. If someone who didn't know any better tried to approach it, the animal might respond with defensive, aggressive behavior, including biting. Want to know what to do (and what NOT to do) if you see a seal on the beach? Check out the rescue rehab pages. So why did it come so far inland? We don't really know. The animal looked healthy, and it is normal for them to rest on land. This one just got on a path and decided to keep following it. What can you think of that might cause an animal to travel so far from it's normal habitat? This story does have a happy ending...the wayward harp seal was released and darted straight into the ocean, not even pausing to look back. In a prior post I wrote about "Route" starting physical therapy on its own to help increase the muscle of both rear flippers (BRF) and the right front flipper (RFF). Here is video of the exercise. Once the turtle realized we were videotaping it stopped and decided it was time to eat! MH-08-151-Hy: Our sole hybrid turtle this stranding season. It is likely a cross between a loggerhead and Kemp's ridley sea turtle. 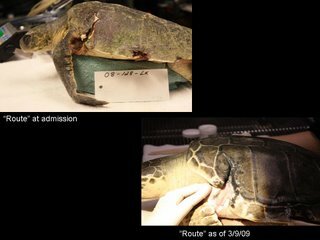 In Dr. Innis' 2008 cold stun season summary report he mentioned we had one hybrid sea turtle. For those of you not aware of hybrids they are the offspring of two separate species. Probably the most famous hybrid is the mule, an offspring of a female horse and male donkey. Typically hybrids are sterile however there have been some cases of hybrid sea turtles producing fertile eggs. This year's hybrid sea turtle we guess is a cross between a Loggerhead turtle and a Kemp's ridley turtle. We will not now the exact species until we get genetic results back from this turtle. With that information we will be able to tell which species was the mom and which species was the dad. So ... how can we tell that a turtle is a hybrid? After seeing so many turtles that come in extremely debilitated we will occasionally see an animal whose appearance does not look quite right. It may have a body that looks like a loggerhead but th e face has a bit of ridley to it. Or possibly a turtle that looks like a green sea turtle but has overlapping scutes like a hawksbill. After some debate amongst staff and volunteers on whether or not we think a sea turtle might be a hybrid we then set off to determine hybridization by counting different sets of scutes. Scutes are the bony "scales" on the sea turtle. Each species has varying numbers and qualities of scutes. The turtle on the right is a hybrid Hawksbill/Green sea turtle. One of the giveaways is that the scutes are overlapping. We use an identification key to help us determine which turtle has which set of scutes. Do they overlap, what coloration, how many scutes should the turtle have? Seaturtle.org has a great identification key and it can be found at here (pdf) . You can see from the turtle, 02-833-Hy, there are only 4 costal scutes (the larger scutes that run on either side of w here the "backbone" would be) this is indicative of a green or hawksbill sea turtle but when you look at the prefrontal scutes on the head this is not what a green sea turtle or hawksbill would have. The head looks very much like a loggerhead. After getting genetics back on this turtle we found out the mother was a loggerhead and the father was a green sea turtle. MH-02-833-Hy is a hybrid of a Loggerhead and a Green sea turtle.